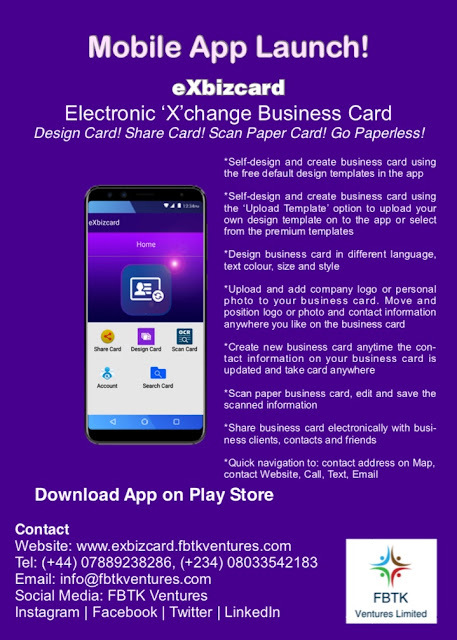 Lagos – October 2, 2018 - FBTK Ventures Limited, today announced the launch of its Mobile App, eXbizcard - a creative, unique and easy to use app that helps users self-design, scan paper card, share or exchange and manage business cards. The App is particularly useful for HR, business developers, entrepreneurs, sales people, or marketing experts or anyone who works in other industries that makes use of business card. With the effect of global warming palpable in our day to day life, eXbizcard is out to make sure we move beyond the need to cut down more tress - an act which further degrades our environment and accelerates global warming. But beyond that, eXbizcard uses smart technology in lieu of cutting down trees to provides a smart and more convenient alternative to the physical business card. eXbizcard is encouraging users to “Go paperless” in a bid to create a greener planet! The App is a must have for business men and women or anyone who has the need to have their business information in handy. The App helps store users’ information, scans and automatically stores information from paper business cards stored on their phone, through the App. Apart from it been an app to design, and exchange and also scan paper business card, the main goal is to go paperless for making business card in order to reduce the numbers of trees been cut down. Recent statistics data show that over 10 billion of business cards is produced annually and 88% of it end up in the bin. One of the 17 SDG goals is climate action and this app is in a way contributing towards these goals. The more trees been cut down, the less natural oxygen production and more carbon dioxide released from tree decomposition – One large tree can supply a day’s supply of oxygen for 4 people! · Quick search to find contact. 1. Search in Play Store and App Store eXbizcard, download and install it on your phone or any smart device. 2. Open the app and Sign Up as Company or Personal to start enjoying our services. You can also access the app as Guest, however you will need to Sign up to be able to enjoy the full benefit of the app. 3. Go to Design Card to design your own card. Select a Language and then click on the camera icon to upload your company logo or personal photo or take instant photo and fill in the details you want to appear on the card. 4. Then select Preview and choose a card design template from the basic design templates provided. There is also option to Upload Template (your own self-design template) or choose from the premium templates. Note - This is a premium service. 5. After choosing a design template, position phone in landscape and hold down the logo or photo and details on the card to move and place them anywhere on the card. Make sure portrait orientation lock on your device is turned OFF in order to be able to design card in landscape. Text Colour, Size and Style on the card can be changed. Once this is done and you are happy with the business card design, click on the Save icon to save card. If unsatisfied with the design, you can go back and edit before saving. Card can also be designed in portrait, however it is best to design and save card in landscape layout (Note - the layout card is designed is the same layout card will be saved). 6. Go to Scan Card to scan paper business card using the camera on the phone or smart device. After card is scanned, click Next and select a Language and then click on the camera icon to take photo of the paper card. Then correct or fill in any missing details not scanned to appear on the card. Follow steps 4 and 5 to complete the paper card scan. If for any reason the information on the paper card is not detected by the scan, click Next and manually input the details from the card. 7. Go to Share Card to see the card saved (Designed Card and Scanned Card). Card saved can be deleted if not satisfied with it and create a new one by following the steps above. Card can also be saved on user device. Click on the card saved to view and share with clients and friends by clicking on the Share icon. Also navigate to Company website and Address by clicking on the Web and Location icons. Option to make direct call, send text message and email using the information on the card are also possible. 8. Go to Search Card for quick search to find contact. 9. Go to Account to log out of the app. It is advisable for app users not to log out of the app so that users can have quick access to their business card. 10. Option for eXbizcard app user to exchange and receive business card from another eXbizcard app user is going to be made available in the next app upgrade version. 11. Recommendations - For scanning paper business card, we recommend users device to have strong camera mega pixel, the lens is kept clean and position card in good light. For designing card, it is best to design and save card in landscape layout. For card exchange via Text, ensure your network provider supports MMS. Also users to always back up their data and not delete the app from their device to avoid losing the app data saved. Cards deleted from the app can not be retrieved. However, during installation of the app, it request to access device camera and storage and if user opt for this option, the app is able to create a local folder called 'Card Design' on the device which will contain archive of the cards designed. The folder can be found in the device File Manager - Storage. "Thank you for downloading and using eXbizcard. We believe there is always room for improvement in anything in life and our aim to keep developing and improving our app to meet your needs so do keep an eye out for improvements and updates as more features will be added to the app in the next upgrade version. We appreciate your feedback”. Currently the app is designed on Andriod platform but there are plans to also have it available on iOS platform in the next coming month. Or search for exbizcard on google play store.